Often Gilded-Age politics has been described as devoid of content or accomplishment, a mere spectacle to divert voters from thinking about the real issues of the day. But by focusing too closely on dramatic scandals and on the foibles of prominent politicians, many historians have tended to obscure other aspects of late nineteenth-century politics that proved to be of great and long-term significance. 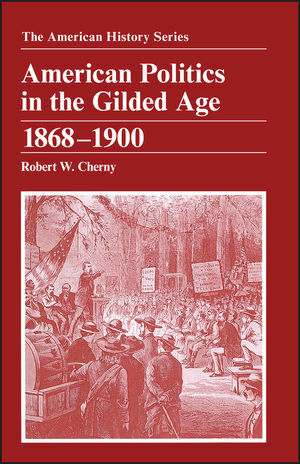 With the latest scholarship in mind, Professor Cherny provides a deft and highly readable analysis that is certain to help readers better understand the characteristics and important products of Gilded-Age politics. Topics covered include: voting behavior; the relation between the popular will and the formation of public policy; the cause and effect of the deadlock in national politics that lasted from the mid-1870s to the 1890s; the sources of political innovation at state and local levels; and the notable changes wrought during the 1890s that ushered in important new forms of American politics. Robert W. Cherny is professor of history at San Francisco State University, where he has been a member of the history faculty since 1971. In 1995—96, he served as president of the Society for Historians of the Gilded Age and Progressive Era. He was the Distinguished Fullbright Lecturer at Moscow State University in 1996 and held a fellowship from the National Endowment for the Humanities in 1992—93. He received his Ph.D. from Columbia University in 1972 and his B.A. from the University of Nebraska in 1965. His books include A Righteous Cause: The Life of William Jennings Bryan (1985, 1994), Populism, Progressivism, and the Transformation of Nebraska Politics, 1885—1915 (1981), and, with William Issel, San Francisco, 1865—1932: Politics, Power, and Urban Development (1986). His essays include “William Jennings Bryan and the Historians,” Nebraska History (1996), “the Democratic Party in the Era of William Jennings Bryan” in Democrats and the American Idea: A Bicentennial Appraisal (1992), and “Willa Cather and the Populists,” Great Plains Quarterly (1983). He is also co-author of Making America: A History of the United States (1995).